One of the world's most famous balconies juts out of Argentina's Presidential Palace, known as the Casa Rosada. The pink building has been the scene of many a political rally, particularly during the regime of the notorious and tragic Juan and Eva Peron. The building began as a fort in 1594, and was turned into a castle-like centre for colonial government in 1713. Additions and changes were made to the building until 1857, when it was demolished and the Casa Rosada we know today was built. The Italian style building, fronted with palm trees and fountains, was painted pink when it was converted from a Customs and Post Office building into the presidential palace. 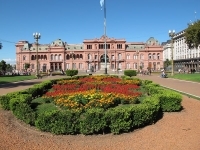 President Sarmiento decided to appease opposing political parties by merging red and white into a pink colour scheme for the palace. The building has since been declared a National Historic Monument of Argentina. Today the building houses a small basement museum displaying some presidential artefacts. Each evening, a small platoon of mounted grenadiers emerge from the guardhouse to lower the flag on the Plaza, adding a touch of pomp and ceremony to the pretty building. Opening times: Museum: Monday to Friday 10am-6pm, Sundays 2pm-6pm. Guided tours are available.